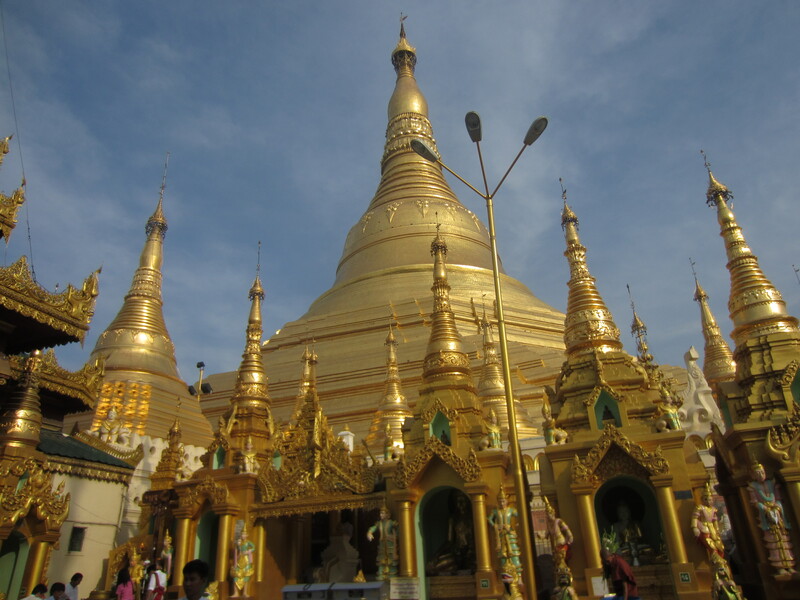 As mentioned in my first Myanmar post, I was a bit nervous traveling to a country whose government has such a violent and oppressive reputation. And of course, they would be having by-elections during my visit. While everybody said election time should be safe, I wasn’t really sure what to expect. This would be the third time in more than 20 years Myanmar had a democratic election, and only two years since the military government transformed into a “civilian” government, still led by former military men. Furthermore, this would be the first time Aung Sang Suu Kyi’s National League for Democracy (NLD) party would be running for office since “The Lady” was put under house arrest in 1989 and her party’s landslide 1990 election victory nullified by the military junta. In the weeks leading up to the election, we saw campaigning throughout Myanmar, and it was fascinating. 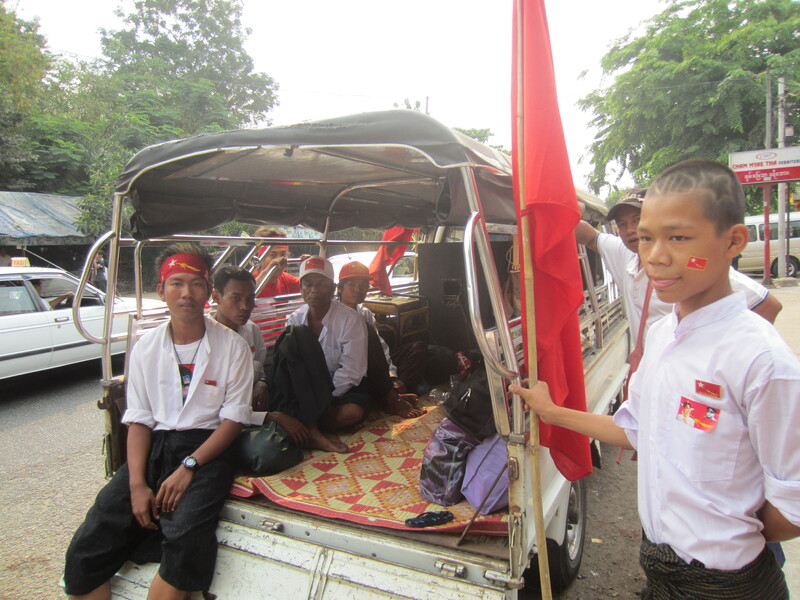 Parades of trucks drove through small towns bearing loudspeakers and loads of people, all wearing NLD t-shirts and all with big smiles on their faces. Campaign tables sold t-shirts, buttons and flags bearing the red NLD slogan and faces of Aung Sang Suu Kyi, as well as her father General Aung Sang, heralded by many as the father of modern day Myanmar. As the world watched (foreign observers being allowed in for the first time), the NLD succeeded in winning 43 out of the 44 seats it contested and largely without problems. While the win only gives the NLD a small minority in Myanmar’s still military party-dominated parliament, it does give them a foot in the door and a voice unheard for the past 20 years. Unfortunately, I was caught in a 12-hour bus to Yangon on the day following elections, but when I did finally reach the city I still found plenty of activity happening in the NLD headquarters. 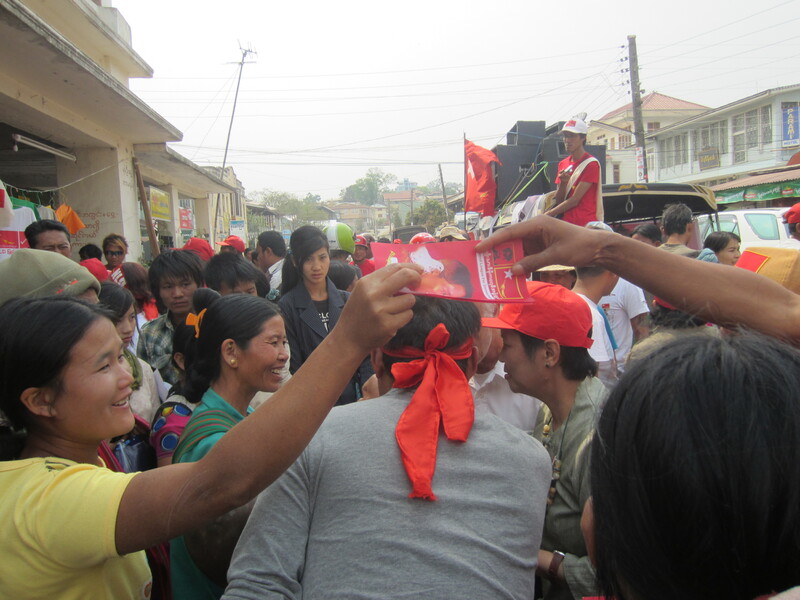 While the immediate celebrations had finished, dozens of people still loitered both inside and outside the building, while supporters continued to sell NLD t-shirts and other items outside. In fact, vendors all throughout the city were selling NLD t-shirts, something that would have been unheard of, even illegal, just a few months beforehand. While speaking with supporters outside, one girl invited me to an election celebration to be held the following day in a town nearby. Between her broken English and our rushed conversation, I really had only a 30 percent idea of what was actually going on the next day. All I knew was I had an address scribbled on a piece of paper written in English and Burmese with instructions to arrive around 9 a.m. the next morning. Somehow the next day, I managed to convince my friend Gloria plus two random strangers to share a taxi with me to the middle of nowhere to take part in a random event I vaguely understood. And the experience was unforgettable. An hour from Yangon, we found ourselves in North Okkalapa, a small, poor village and hometown of Naing Ngan Lin, the NLD winner of Dakkina Thiri, one of the constituencies of Myanmar’s capital city, Nay Pyi Taw. We had been invited to his post-election party. When we arrived in the town, Naing Ngan Lin and about 50 friends, family and supporters were eating and celebrating in a small restaurant in town. As the only foreigners, we were quickly made the center of attention, with everyone, including Naing Ngan Lin himself, eager to speak with us. Naing Ngan Lin had an interesting story. He told me he had been involved in politics for the past seven years, though mostly as part of a separate democratic party, the United Front of Burmese Activists for Democracy, before choosing to join the NLD. His main contribution, however, were his schools. 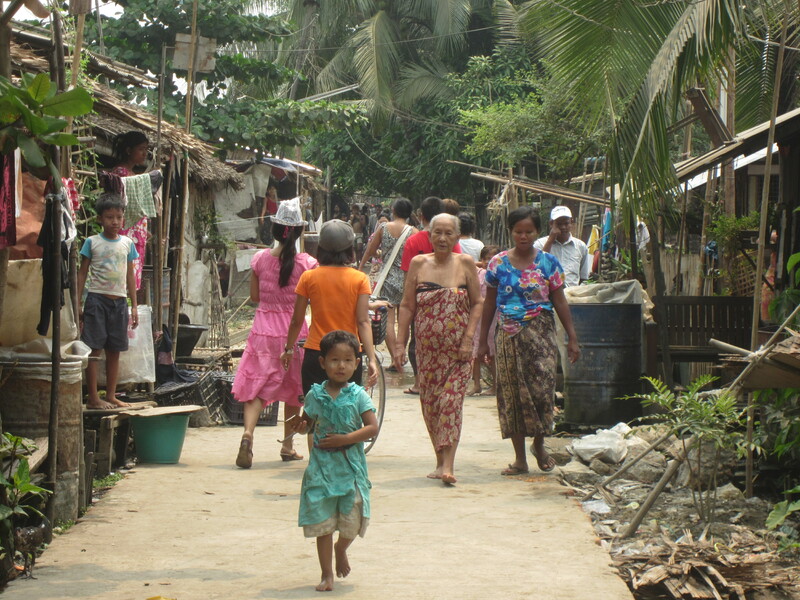 Walking through Northokkalapa, rundown houses stand on stilts standing above mucky water and garbage-covered dirt, while children and stray animals run freely throughout. While money was clearly an issue, one woman told me that many children could not attend school, because they had to stay home and take care of their younger brothers and sisters while both of their parents were at work. Naing Ngan Lin’s goal had been to build free schools for children who could not afford to attend the government schools, and he had created five schools to date. But Naing Ngan Lin’s political activities had made him a suspicious figure by the government for years. In fact, he told me he had been arrested twice, first in 2006 for suspicions that a foreign teacher had been illegally giving scholarships for his school (which Naing Ngan Lin said was false) and second in 2009 for “no reason” one day outside an Internet café. Naing Ngan Lin said, though treated well, he was detained for two months the second time and only released after American Senator Jim Webb’s high profile visit to the country in 2009. Even during his legal campaign for his NLD seat, Naing Ngan Lin told me two of his campaign workers had been threatened, though none of that seemed to faze him. His sights were set on the future. Now, he said, his constituency had two main problems: access to clean water and consistent electricity, and he told me he planned to build a new well. Leaving Northokkalapa, I was grateful I had taken that random taxi to the middle of nowhere and gotten just a little piece of what these historic elections are like for people on a more intimate level. There are a few times in life when everything just seems to come together to create a truly incredible experience. 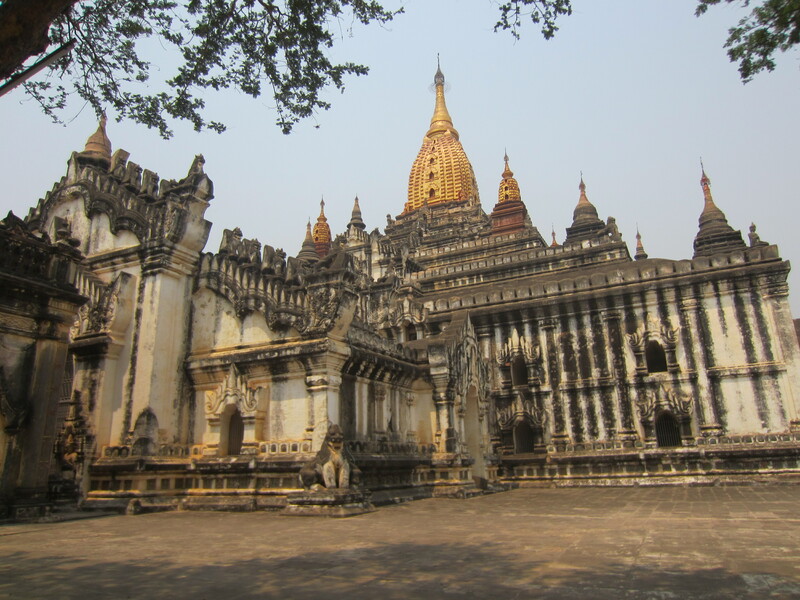 For me, that was Bagan. 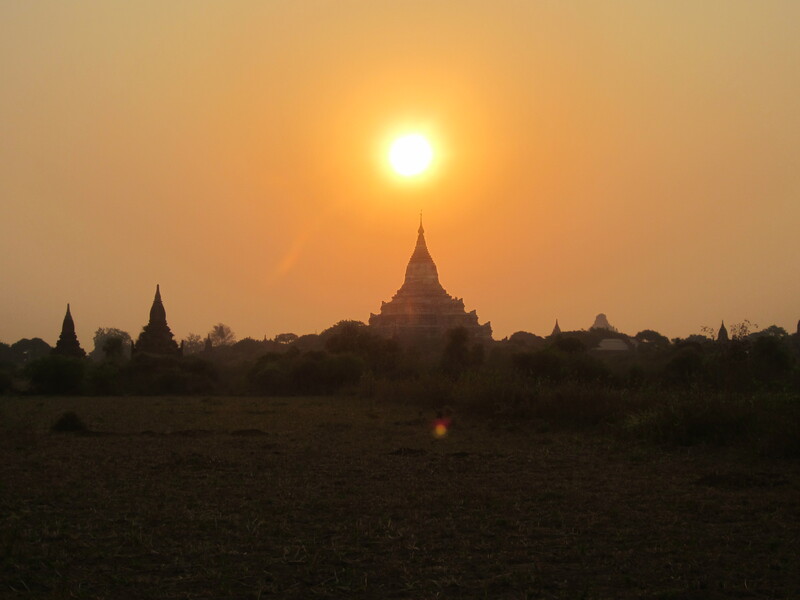 Situated in Western Myanmar, Bagan is THE destination to visit in Myanmar and definitely a highlight of all Southeast Asia. 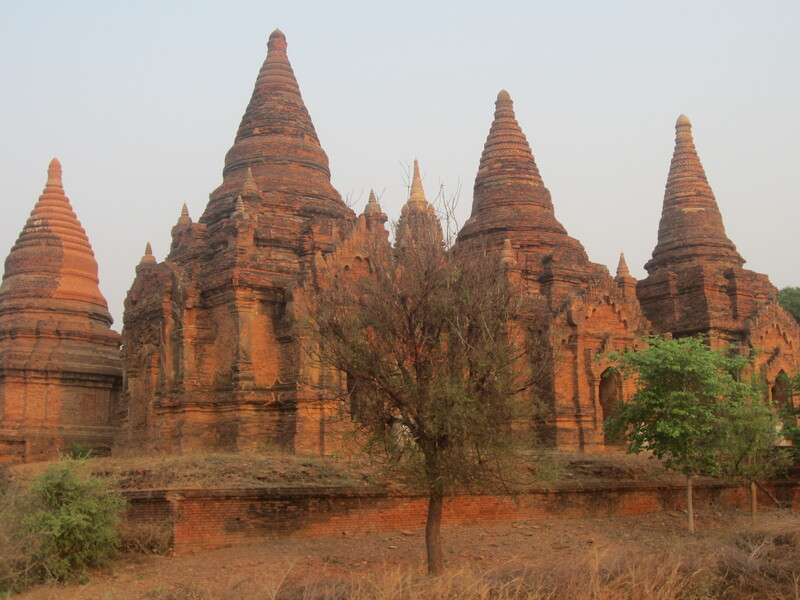 While itself just a small town, Bagan is famous for having possibly the world’s most concentrated collection of temples, pagodas and stupas, most dating from the 11th- 13th centuries. 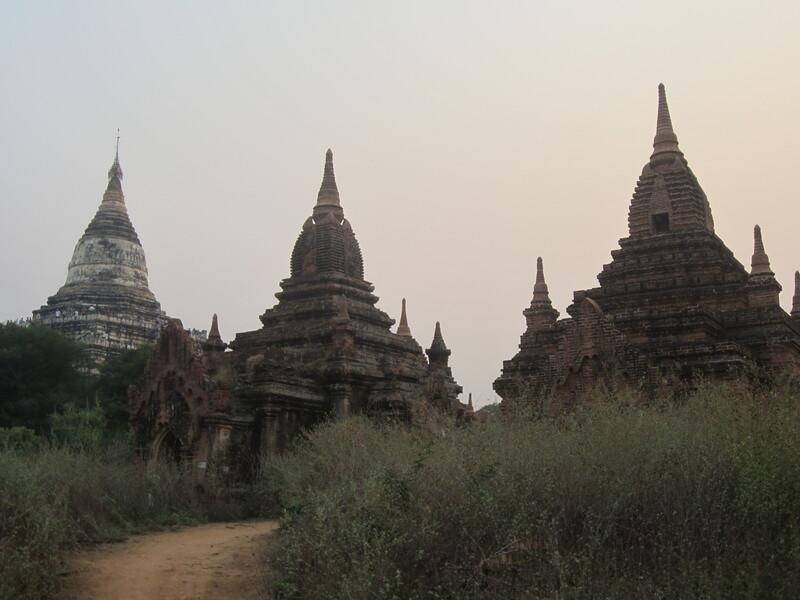 In fact, more than 2,500 temples are scattered among a 13 by 8 km area, leaving endless opportunities for exploration. At the end of the day, Bagan is much better seen than described, and below I have the best pictures of the temples, and fun, of Bagan. I had barely awoken from a nap when two energetic young adults jumped into my carriage and asked if they could practice English with me. In my groggy state, my immediate reaction was to avoid aggressive, young Asians, who usually had an ulterior motive or sale up their sleeves. 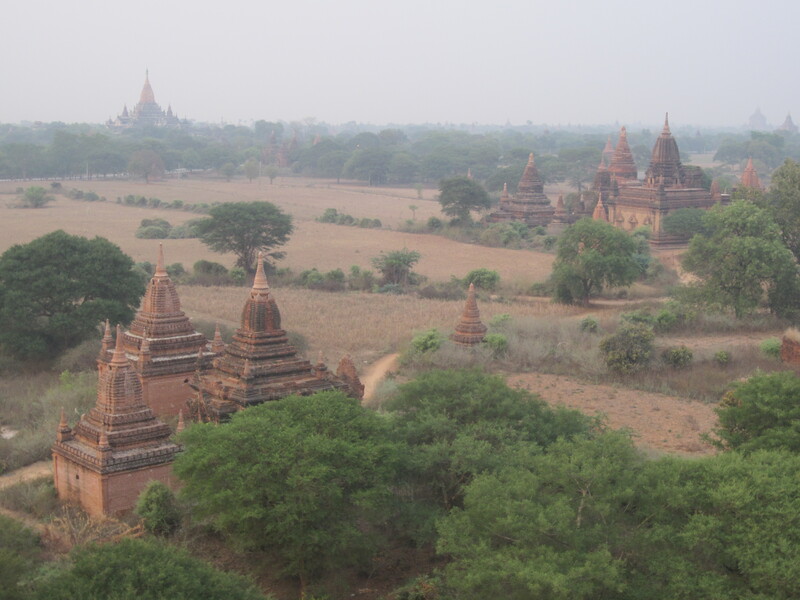 But then I remembered I was in Myanmar, a gentle country, largely isolated from much of the world, and relaxed. I looked around and realized, despite having already traveled six and a half hours by train from Pyin U Lwin, we were only in Kyaukme, a small town still 20 miles away from Hsipaw, my final destination. I recognized the town from my guidebook, an alternative jumping off point to go trekking in the Shan state, which it had described as “far off the beaten track.” While this had initially interested me, the nice lady at the travel agency in Mandalay had quickly dismissed the idea, saying there was nothing to do at Kyaukme, and Hsipaw was the far better option. To be fair, I had never really wanted to go trekking to begin with. 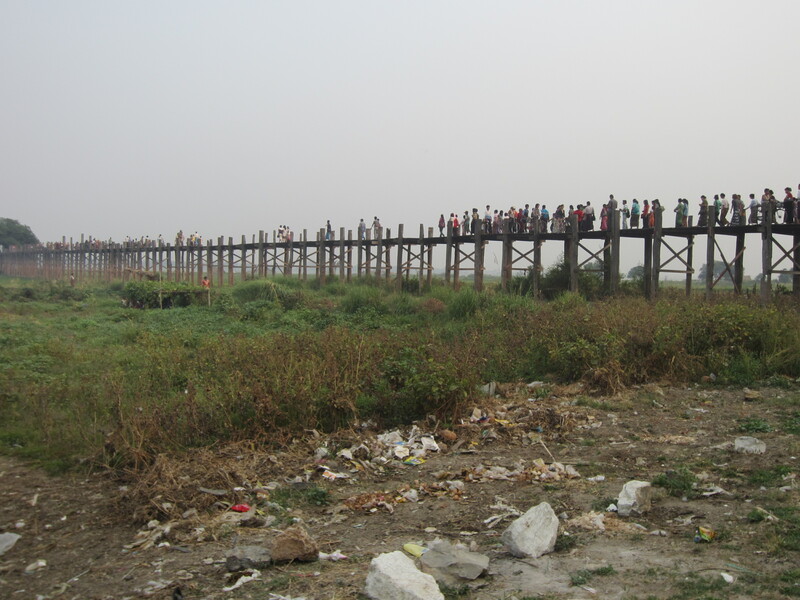 But I had three days to kill before meeting up with my friends in Mandalay, and after months of playing it safe, I thought it might be a good idea to push my travel limits a little bit and try a destination less well-known. As I began to chat, I remembered to speak slowly as we covered the basics: Where are you from? What is your name? What do you do? The two, a 20-year-old boy and a 19-year-old girl, were students at one of the town’s English schools. Every night, they joined a handful of others in the small schoolhouse to learn English with one of the town’s few English speakers, other locals like themselves who’d taken great pains to learn English on their own. Not native English speakers themselves, the teachers encouraged the students to talk with Western visitors during the 30-minute train stop on the way to Hsipaw. As the conversation continued, another teenager joined our group, and I immediately noticed his English was much more advanced than his peers. John was a university student studying English who worked part time as a tour and trekking guide to the few tourists who make it to Kyaukme. From the off-handedness of the information, I knew he wasn’t trying to sell me anything, yet there was something about him and this small town that interested me more. Small, soft-spoken with carefully-placed “messy” black hair, John looked younger than his 19 years. But his direct, yet polite, demeanor revealed a young man with big plans for himself. I pulled out my guidebook as we continued to chat, searching again for why I had planned on going to Hsipaw. 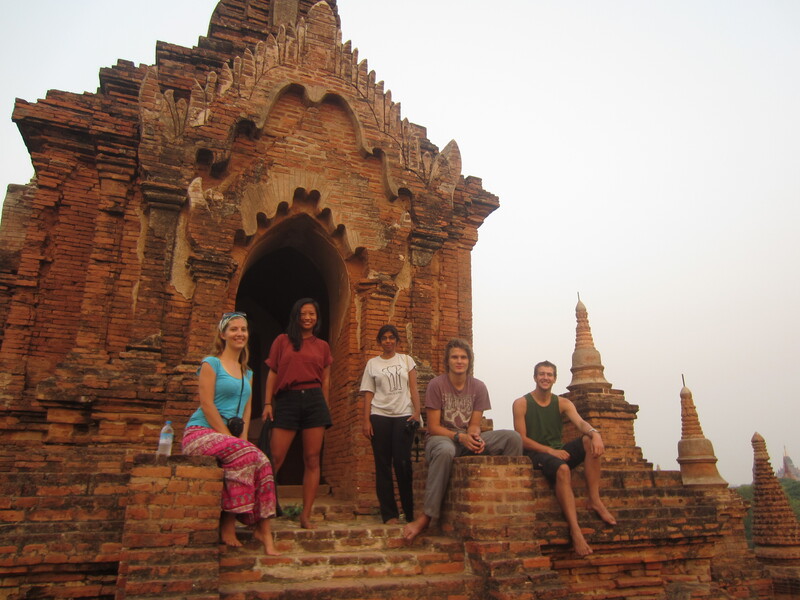 Markets, temples, hills, Hsipaw had lots of attractions listed, while Kyaukme literally had none. I sighed. I liked these guys, but I was going to have to give Kyaukme a miss. But as I heard the train horn sound to leave, something inside me changed. Before I realized what I was doing, I heard myself say, “Ok, I’ll stay!” and the boys quickly helped me grab my backpacks, as we scrambled off the train. No guidebook, no fellow travelers, no recommendations, I had no idea what I was getting in to. But I was ready for adventure. A small village in the eastern part of central Myanmar, Kyaukme has only one guest house licensed to host tourists, and John offered to drive me the short distance on his motorbike. As we rounded the corner to the guest house entrance, he pointed to the young man across the street chatting with an older white couple and told me that was his English teacher, Joy. With only a few English schools in town, none with native speakers, Joy asked if I would mind dropping in to class to speak directly with the students, and I was happy to oblige. Later that night I found myself at the “Best Friend English School,” a small classroom in a building in town. As John and I walked in, I realized I was interrupting a lesson on articles of clothing. About 10 students sat in long, rectangular tables facing their teacher who pointed to a pair of pants and a belt buckle drawn on the chalk board. But despite his own lesson, the teacher warmly welcomed me to the class and immediately pushed me to the front to speak to the students directly. As I stood in front of them, a bit nervous at first, I was greeted by a sea of smiling faces and a cup of tea. A fairly even mix of men and women stared back at me, all ranging from older teenagers and college students to young adults with established jobs or families. I really had no idea what I was doing, so I decided to start slowly and see where things went. After a short introduction, the girls especially, seemed very interested in knowing about my life, and I found myself answering questions about my age, what I did, my marital status and what I thought of Myanmar. At some point, I found myself drawing a mitten on the chalkboard surrounded by some half-haphazard wavy lines as I pointed to my hometown(s) and explained Michigan’s shape, lakes, industries and surrounding states. My second visit to the English school took me a little by surprise. Instead of a Michigan geography lesson, this time the teacher asked if I would teach the students a song. Luckily for them, I’m a bit of a diva ;). Perhaps I was a little homesick, or maybe I just thought a sweet tune with simple, happy lyrics would be a great tool for teaching English, but the next thing I know I’m belting out “My Girl” by the Temptations and pointing to the words I’d scribbled on the board. To my delight, the students really seemed to enjoy themselves, and I got them to do a pretty good rendition of it, if I say so myself. It made me really happy to be able to share a little bit of my home state with them, even if it was in the form of a Motown song that came out 20 years before I was born :P.
Though I enjoyed teaching at the school, I had other ideas on how to spend my time in Kyaukme. As part of the volatile Shan state, the town is only a few hours away from some of Myanmar’s ethnic fighting between the Burmese state and the Shan people, fighting for greater autonomy. 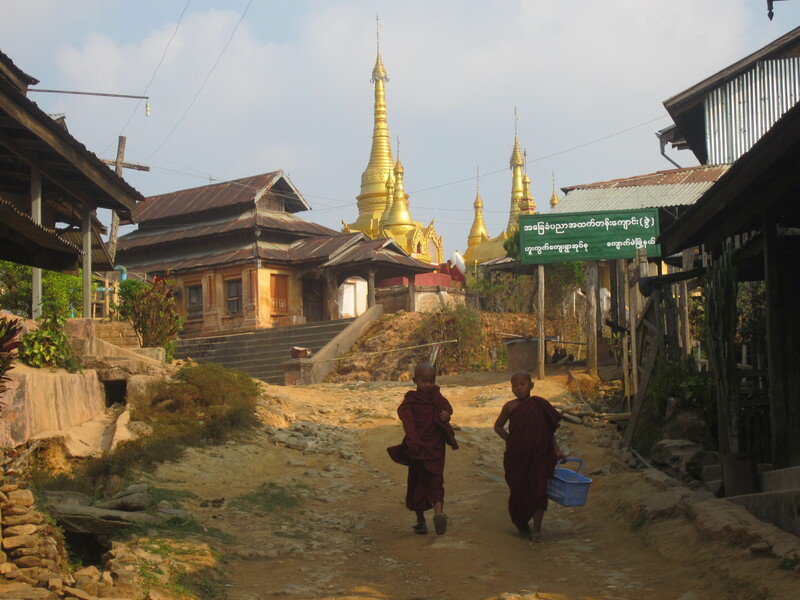 While I was not interested in getting too close to the fighting, I was curious to explore one of Myanmar’s ethnic minorities and see how an entirely different group of people live among a controversial and repressive military regime. To my delight, John was free to take me to the Shan mountain villages, and since he had his motorbike, I did not have to go trekking after all. It was perfect! The next day, as promised, John met me bright and early for our journey to the Shan villages. 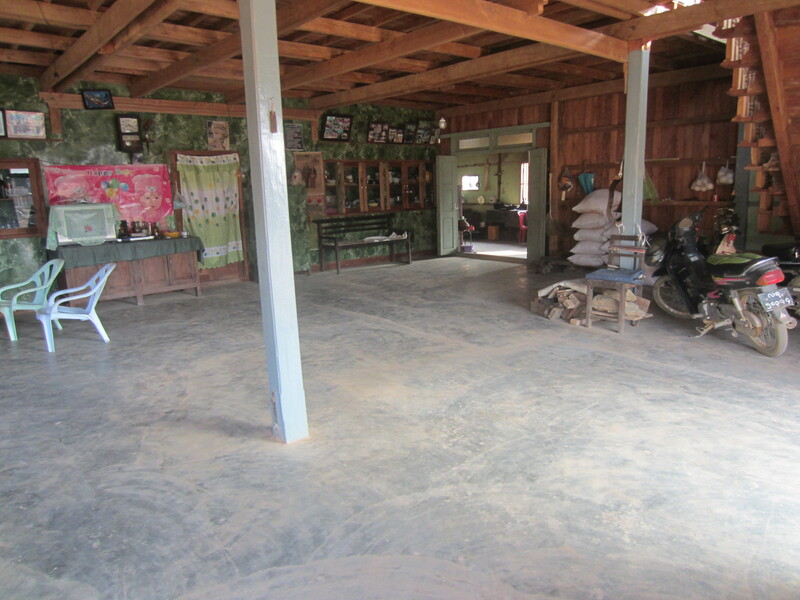 Our plan was to visit three villages that day, sleep over in the last town and return to Kyaukme the next morning. Helmets on, backpacks attached, we rode through the mountains past endless green rice paddies, grazing water buffalo and children playing in the fields. Surprisingly, we did not pass many other travelers on our two-hour long journey, though the all-encompassing dust resulting from the villagers’ annual burning season let us know that we were far from isolated. 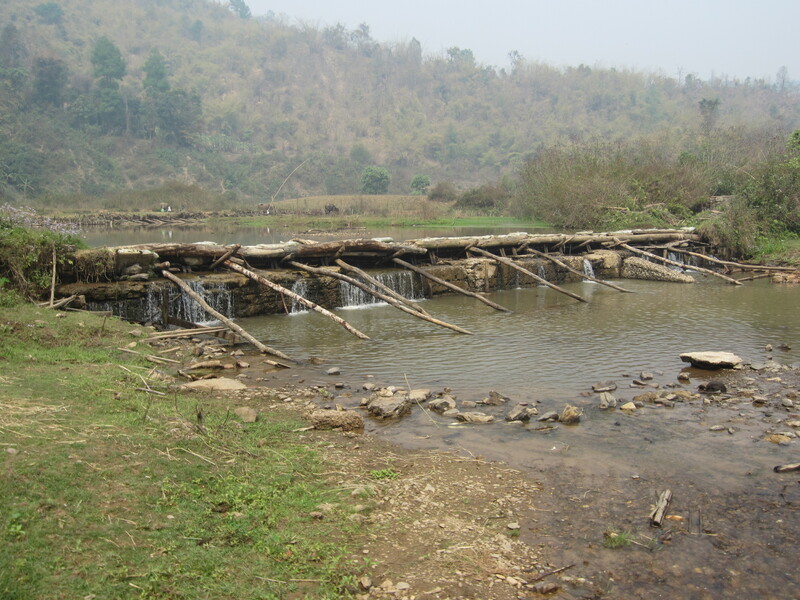 Reaching our first destination, I discovered a scene that would repeat itself throughout the subsequent Shan villages. 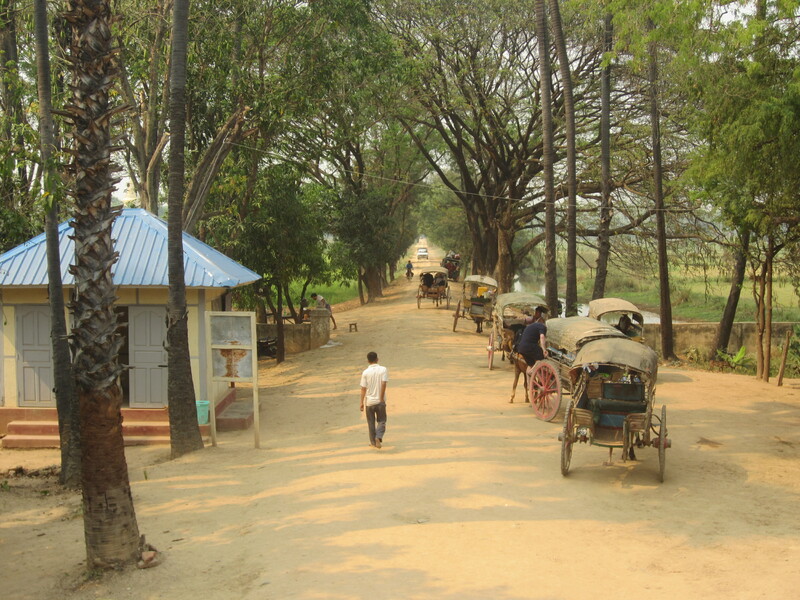 All around, wooden houses with corrugated tin roofs dotting along the windy, dirt road that looped its way through town. Tea leaves lay on mats outside, drying in the sun, as John explained that nearly every villager was a tea farmer. While largely quiet, men worked outside, chopping up bamboo stalks for building or weaving, while women took care of the housework, washing clothes, weaving fabric or preparing food. Nearby up the hill, children gathered in the village’s lone school house, repeating the chanting of the monks to learn their native Shan language. In the middle of town, a small shop sold snacks, drinks and basic necessities, where adults and children alike gathered to pick up supplies, have a drink or simply to visit. And resting quietly at the top of every village lay a gold-covered pagoda, the town’s center for worship and most sacred point. On my trip, John took me to visit several families he knew. While communication was limited, these people graciously invited me into their homes, offering me tea and sunflower seeds while I explored their houses. Surprisingly large, the wooden Shan houses were often two stories high, comprising of a main room, kitchen and one or two bedrooms containing basic beds or lots of open space for bamboo mats and blankets. Plastic or wooden chairs and tables filled corners, while photos of family members and children fulfilling their traditional monk duties dotted the walls. And in every home, a large cabinet full of Buddhas, flowers, incense and photos served as the family shrine. Out back, basic, outdoor faucets on concrete floors provided running water with wooden outhouses nearby. When we reached our final destination, John took me to the home of the village chief who often provided accommodation to the village’s visitors. While he was out of town, his wife made us a simple dinner of rice, eggs, peanuts and a watery vegetable soup. As the power was often out, sunset covered the town in a silent, all-encompassing blackness where even the stars’ vivid brilliance was not enough to keep the town awake. Around 9:30 p.m. John and I headed up to the second floor to find our pillows, blankets and bamboo mats laid out among those of the female farm hands who come to the village seasonally to pick tea leaves. Despite the early hour, I fell asleep quickly in a surprisingly restful night sleep. Around 5:30 a.m. in a stereotypical rude awakening, the roosters began to crow to signal the start of a new day. While John wasn’t too keen on the early rise, I enjoyed watching the women prepare for their day, saying their morning prayers, combing their hair and carefully applying the bark-based thanaka paste to their faces to protect their skin from the Myanmar sun. After breakfast, a large spread of noodles, peanuts and eggs, John and I said our goodbyes and began our descent back to Kyaukme. While I never did make it to Hsipaw, my last-minute journey to Kyaukme ended up being one of the best travel decisions I’ve ever made and a true adventure off the beaten track. Though I know much of the rest of my travels will include the well-paved and well-shared roads to monuments, big cities and tacky souvenirs, I will be forever grateful knowing there is at least one memory that is all mine.